The Productivity Commission (PC) released its long awaited draft report in relation to the Australian workplace relations framework on 4 August 2015. In brief, the PC has concluded that the workplace relations framework is “not dysfunctional” but there are reforms that can be made to improve the framework. Interestingly, a reform that has been “floated” by the PC is the idea of a possible new type of individual statutory agreement to be known as the “enterprise contract” to meet the needs of small and medium sized businesses (see chart as extracted from the PC’s draft report). An enterprise contract would, subject to a no disadvantage test, enable employers to vary a term(s) of a Modern Award for an entire class or group of employees without the need to either negotiate with each employee on an individual basis or form an enterprise agreement. An existing employee would be able to choose whether to sign an enterprise contract or stay with their existing employment contract. The employer would be required to provide employees with a written form of the enterprise contract, so they were aware of its entitlements and obligations, which would then be lodged with the FWC. In contrast to an enterprise agreement no prior approval would be required of an enterprise contract before it is lodged with the FWC. The FWC would test compliance using the no disadvantage test following a complaint by an employee covered by the enterprise contract. A failure of the enterprise contract to pass the no disadvantage test would empower the Fair Work Ombudsman to vary the contract (which would include all other relevant employees covered by the same enterprise contract). 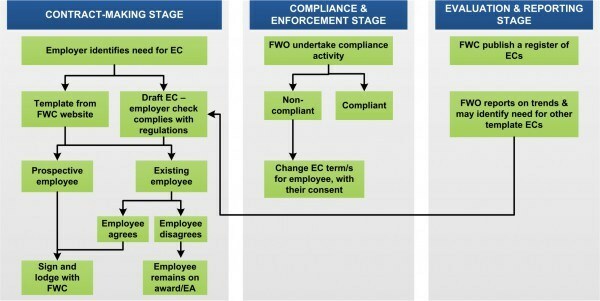 The lodgement of the enterprise contract would also allow the FWC (or the Fair Work Ombudsman) to analyse the nature and trends in such contracts, and to provide a basis for industry templates that would enable any business to adopt a contract with certainty that it would pass a no disadvantage test. An employee could exit the enterprise contract after one year and return to the award (or any other agreed contract). In relation to the last option the PC’s view was that enterprise contracts might provide a natural vehicle for progression to standard enterprise agreements as employees could, after one year, elect through a majority vote to commence enterprise bargaining. To test the PC’s “floated” idea of an enterprise contract further, it seeks information on the costs (including compliance costs) and benefits of an enterprise contract from employers and other stake holders. The advantages and disadvantages of the proposed opt in and opt out arrangements. The PC has invited submissions from employers and other stakeholders that are to be made by no later than Friday, 18 September 2015. The PC’s idea for an enterprise contract in its draft report recognises the practical difficulties, including high cost of negotiating individual arrangements and enterprise agreements under the current workplace relations framework. Cleary the PC’s enterprise contract idea is targeted to small and medium businesses who have not traditionally engaged in enterprise bargaining because “the procedural aspects of such bargaining can be daunting…”. In South Australia, the option of an enterprise contract could provide a cost effective and flexible work arrangement for its high proportion of small and medium businesses. The ability to utilise template enterprise contacts which could provide for industry tailored flexibilities not available under applicable Modern Awards, coupled with the avoidance of compliance costs associated with formal approval of such contracts, are likely to be attractive to this group of employers. A largely negative response to the idea for an enterprise contract with comparisons to “AWAs” (which became associated with the former WorkChoices framework) can be expected from the trade union movement in its submissions to the PC. Employers will await with interest as to whether the Coalition Government will adopt any of the PC’s recommendations (including the possible idea for an enterprise contract) as contained in its final report in the lead up to the next Federal election. Workplace Relations Framework, Productivity Commission Draft Report, August 2015. See chart as extracted from the Workplace Relations Framework Draft Report. Page 37 of the Workplace Relations Framework Draft Report.